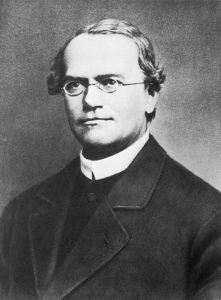 Gregor Mendel, the monk who became famous for his pioneering work in plant genetics, initially wanted to create new, better crops. Only at a later stage did he become fascinated by how plant traits are inherited. This is the conclusion of a study published by KeyGene’s plant breeding researcher Peter van Dijk in the scientific journal Genetics. Van Dijk’s findings are based on two recently discovered newspaper articles from 1861. 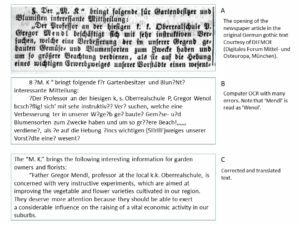 They contradict what many historians have written about Mendel’s motives and demonstrate that the origin of breeding of innovative, improved vegetable crops can be traced back to as early as the 19th century. Mendel is known to the general public as the founder of genetics. With his experiments with peas, Mendel showed that crossing of plants cannot be compared with mixing two fluids, but rather with passing on of ‘hereditary particles’ to the progeny. Due to misunderstandings , Mendel’s notes were burned after his death so that, to date, nothing was known with certainty about Mendel’s motives. Peter van Dijk: “There was a gap in the crucial period between Mendel’s graduation in 1853 and his famous pea publication in 1865. I became fascinated by that 12-year gap and started looking for information from that period”. Surprisingly , Van Dijk was actually assisted by modern technology. Many old back issues of newspapers are now being digitised and made accessible via internet. Thanks to the use of so-called OCR software, digital images can be converted back into texts that can be easily searched with the help of search engines. The scientific article by Peter van Dijk of KeyGene and his co-authors Franjo Weissing of the University of Groningen and the Institute for Advanced Study in Amsterdam and Noel Ellis of the University of Auckland is open access and can, therefore, be read by anyone on the internet.